I am certain there is a great deal more to Marrakech than Djemaa el-Fna square and the alleyways winding up to it. But the goings-on in and around the centre of the medina occupied most of my time in Morocco’s ‘red’ city. Here are a few (mostly food related) observations. Djembaa el-Fna. As someone who’s had the displeasure of packing up a white van, unpacking, setting up a street food stall, cooking, selling, deconstructing, packing up, unpacking, washing up … repacking, repeat (you get the picture), there’s beauty and poetry in the dance of the food sellers as they arrive in Marrakech’s main square just before dusk. Four by two metre carts, ingeniously laden with chairs, tables, grills, pots and (literally) the kitchen sink appear from nowhere, towed by three or four vocal men. The cart is dumped and rapidly unpacked, produce arrives and within half an hour the once empty square is full of identikit food traders. At darkness these stalls are a hive of eaters and food pimps. The majority of the stalls are uninspiring, but there are definitely a few pearls amongst the grit. We followed standard protocol and avoided the places haranguing most desperately for business, instead looking for where the locals headed. 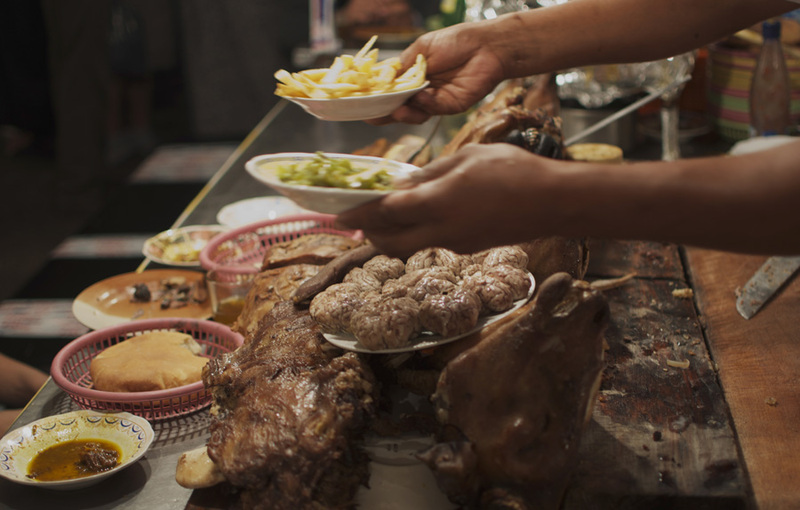 The carts selling snails and broth for 5-10 dirham (35-70p) were always busy; two sites on the south-west corner pumped alluring meat fat smoke from their grills and were packed. We got a stool at one of those (stall 32) and ate a superb tagine (see below) and spicy, sticky, little beef sausages from the grill. The hue of Marrakesh’s naked bulbs give the place a film set-like ambience. I enjoyed the atmosphere and content of this scene much more than I thought I would. Sheep heads. The best thing I ate that evening, however, was from one of the two sheep head stalls in the middle of the chaos. 15 dirham (that’s a quid, folks) for a mixed plate of lung, tongue, head scrapings and a bit of stewed neck, breast and shoulder. Served on a plastic plate to be eaten with your fingers and a bread roll. It was heavenly. You can get the whole head to pick at for about £3. Brains cost extra. Corn, beans, egg men. Forget tacos, my favourite street food in Mexico (and central America generally) are corn cobs. Beautiful, sweet, plump corn, steamed and, if you’re lucky, browned a bit over a charcoal grill, then liberally sprinkled with salt and dried chilli and served on a stick. What’s this got to do with Morocco? 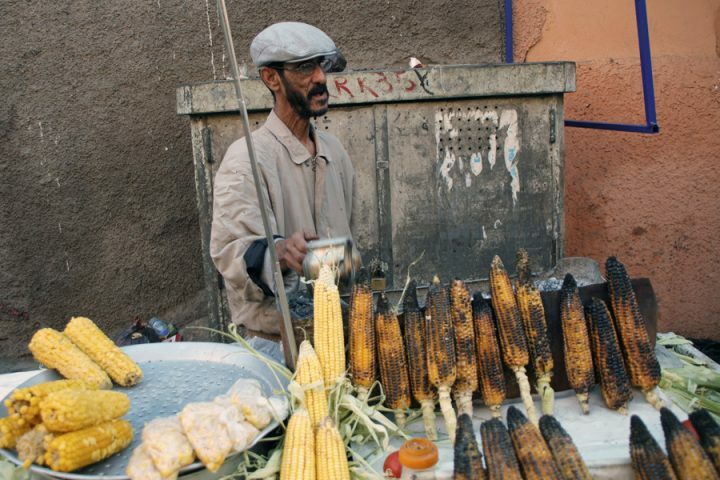 Well, there are plenty of corn carts in Marrakech too. Sadly, it appears local practice is to slowly carcinogenise thin cobs, drying out the corn and rendering it pointless. One chewy bite was enough. Bags of boiled corn kernels were also on offer. But those I saw had absorbed so much water, that they were translucent and close to bursting, with their natural sugars and flavour long gone. Let’s not romanticise – the origin and continued reason for most of the world’s street food is a need for cheap, quick sustenance. This street food scene is not led or fed by social media. It’s not about ‘innovation’, twisting traditional flavours or capitalising on trends. Maybe it’s quite reassuring that no nonsense, no frills, one option stalls, like my corn dude, are commonplace: real Marrakech continues to operate despite the tourist dollar. Trolleys selling bessara – boiled fava beans and a cup of stock – and bread rolls packed with hard boiled eggs were also popular. 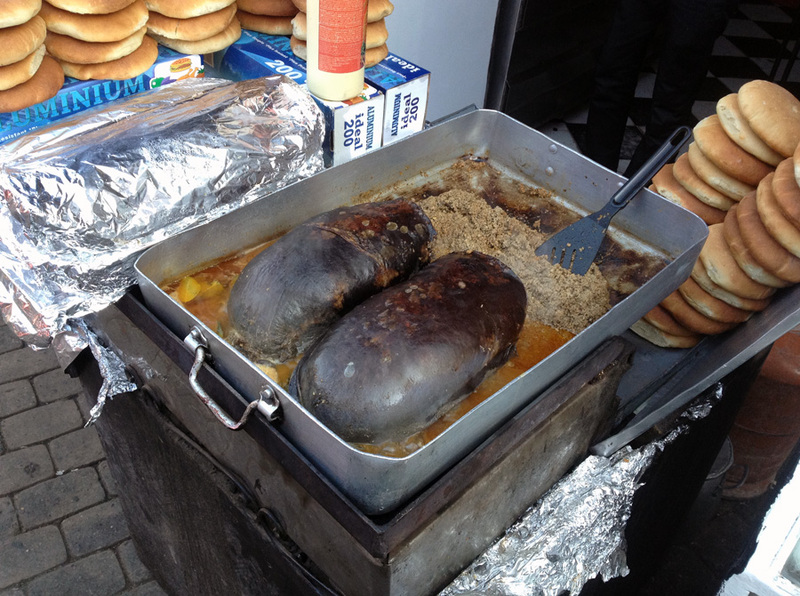 On the flip side, stuffed camel spleen was one dish for locals that looked totally awesome. Bulging, blackened, smooth lacquered sacks, about 20cm wide and almost half a metre long, sat in the trays they’d been braised in. Glossy, juicy minced meat and offal bursting from one end, ready to be scooped into hollowed out bread pockets. I massively regret not having a chance to try this dish. My guess is it’s basically like haggis, without the oatmeal. This and the sheep stall are two of the three food memories from Morocco that will stay with me longest. We need more offal in London’s ‘street food’ scene. #hashtagcamelspleen. Tagine. I ate tagine dishes in casual tourist restaurants, aspirational tourist restaurants and at a luxury hotel. 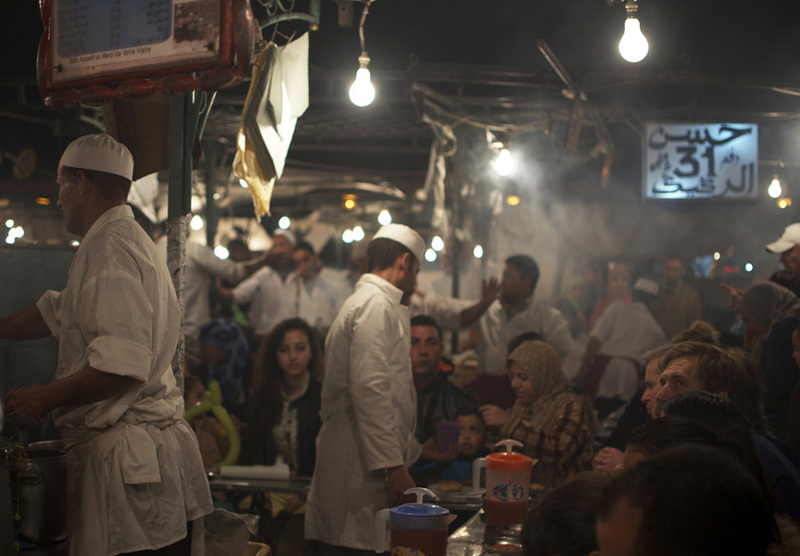 None of them came close to the tagine I ate at stall 32 in the square, which was rustic, gutsy, intense and earthy. The meat slipped off the bone at a touch, but its fibres still had a bit of chew. Flavourful, robust but yielding chunks of carrot, starchy potato, sweet potato and cabbage sat soaking up the viscous, spiced stock. It was pleasing to see we snap-happy tourists are not being played – Itsu and Pret don’t lie in courtyards behind high ochre coloured walls and even McDonalds’ presence is limited. Instead, workmen take their lunch break in the street, crouched around huge clay pots piled with couscous, stewed meat and vegetables. If there’s a building plot or road work, there’s a half metre wide tagine dish somewhere nearby. These are all questions I neglected to ask the men demanding, with no success, that we enter their store. 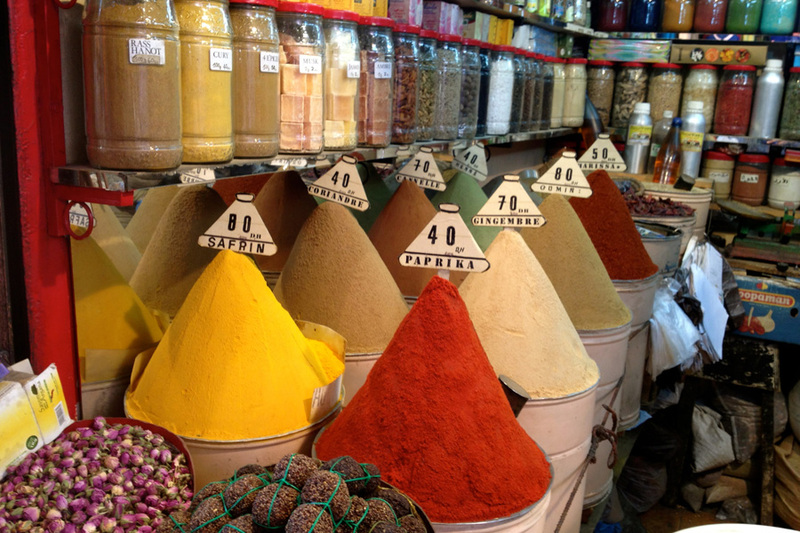 Shops away from the souk were selling spices to locals from wider bins. No cones in sight. Moroccan mint tea … is maybe one of the most disgusting things to pass my lips this year. Over-brewed and at least fifty per cent sugar. No wonder every fifth doorway in the medina has ‘dentist’ written over it. Grim. Bread. Perhaps the most intriguing and illuminating fifteen minutes of our stay was spent in a dark but ornate room, with a baker and his mate. 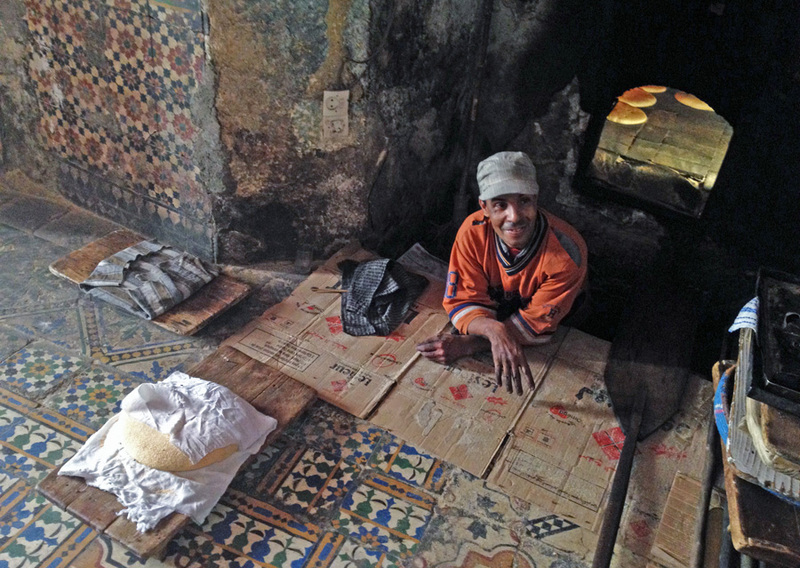 We’d walked past and seen dozens of flat, round loaves (typical Moroccan bread – khobz) stacked on grubby concrete shelves, and decided to go in and chat. Our lack of Arabic limited the conversation somewhat. But as children and housewives popped in and out with trays of shaped dough covered in scrap cloth, it became clear that it was this man’s role to cook his neighbours’ bread. There were between forty and fifty loaves in the wood fired oven behind him, slowly gaining a golden crust. He was clearly a dab hand with a paddle, and his memory for whose loaf was whose must have been pretty good too. I’d quite like a communal bread oven like this near me. The Morocco trip came about after winning a Morocco tour from tailor made tour operators Cox and Kings. 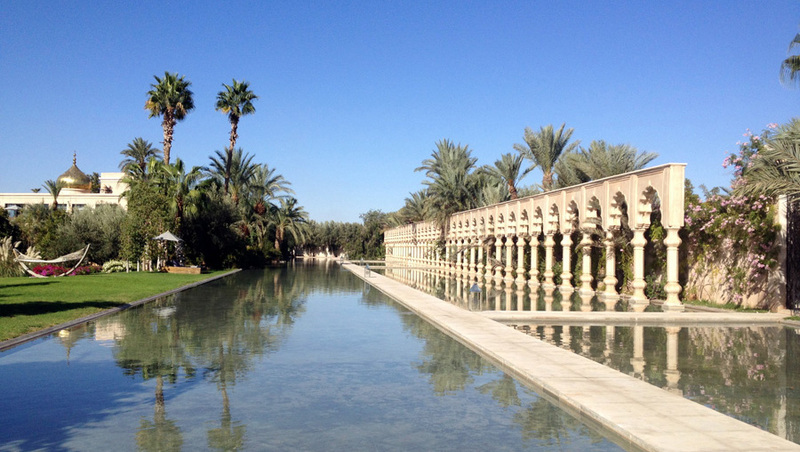 After two nights staying in a riad that we’d found, we were whisked off to Palais Namaskar – twenty minutes by car, but a world away from the Medina. “Luxurious”, “blissfully quiet”, “pimping condo and private pool” sum up the next 3 days. We could have popped in to town or over to the mountains whilst there, but instead decided to do absolutely nothing. Lovely stuff. Have been a long time follwer of your blog – but this made me want to hop on a plane! On my bucket list. Loved this article. The array of food on offer in the Marrakech streets is amazing & cheap. 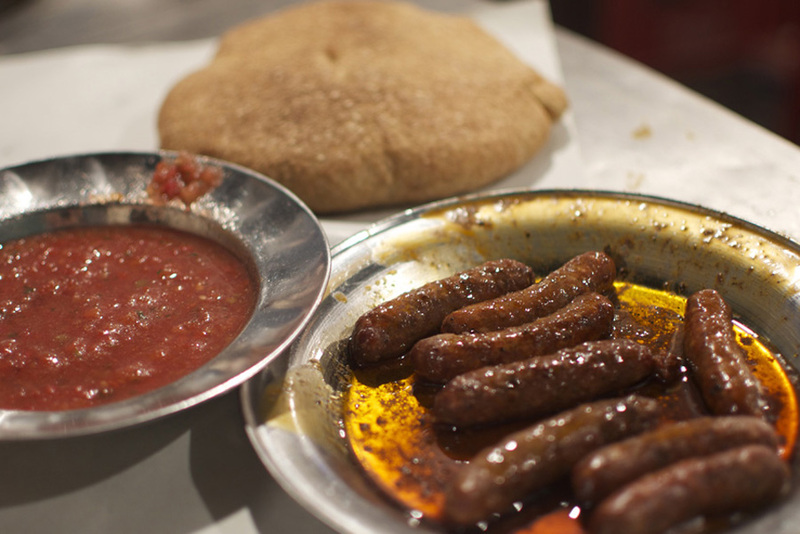 On Derb Dabachi every evening, there is a guy who sells the stuffed camel spleen & he is always busy! Linda – glad you liked it. Derb Dabachi was where I was most tempted by spleen! 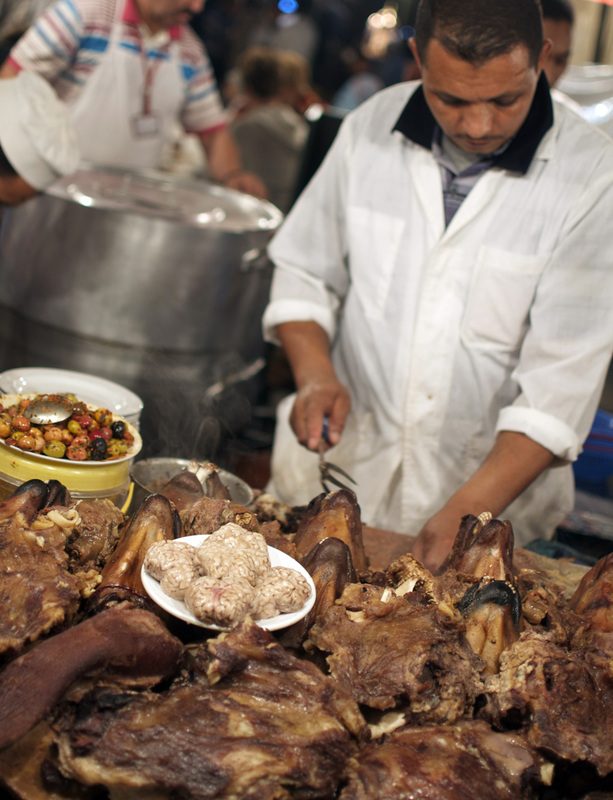 I loved Marrakech but that food market in Djemaa el-Fna unfortunately gave me food poisoning! Found a fantastic restaurant in the souk called Le Jardin – (http://www.tripadvisor.co.uk/Restaurant_Review-g293734-d2654194-Reviews-Le_Jardin-Marrakech_Marrakech_Tensift_El_Haouz_Region.html) which was excellent! I really enjoyed this post in general, but the bit you wrote about what street food has become and what street food is really about really made me stop and think for a moment. I know we’ve been spoiled in London with the street food scene and how it has become a ‘trend’ thing, and I first got into it in Los Angeles with their food trucks, but not until now have I really stopped to think why the whole thing started and for what purpose. Brilliant post. Ed, agree with you completely regarding the mint tea. However when I was in Essuaria last I discovered that most of the locals drank it with ‘Sheba’ or absinthe leaf. Much nicer, also in th down at heel places they always let me add my own (mush smaller amount of) sugar. The absinthe leaf adds an intriguiging herbal bitterness to the tea as opposed to the mushy one note of sugared mint. Fascinating article. Not sure about the stuffed camel spleen though!